Virginia Ruth Albright, 91, of Hoyt, died Sunday, Dec. 6, 2015, at Vintage Park Assisted Living in Holton. She was born Jan. 14, 1924, on a farm near Meriden, the daughter of William and Amelia Fritton Hart­man. 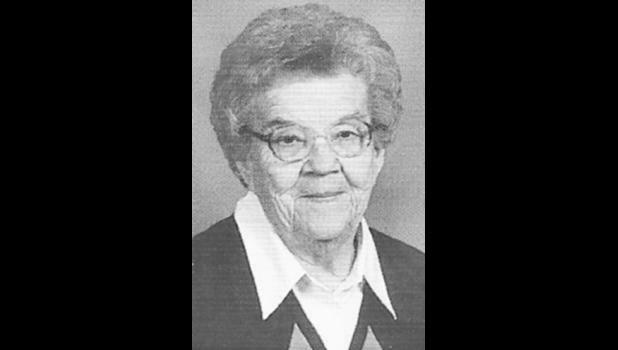 Virginia was a member of St. Francis Xavier Catholic Church in Mayetta, the Altar Society at the church, Hoyt Senior Citizens and the Nortonville Quilting Guild. She was an award-winning quilter whose quilts were highly sought after. She had won many awards, including the Ben Franklin Quilting Award, and had made numerous quilts over the years for charities and as cherished gifts. Virginia was a farmwife and a homemaker. She married Gerald “Jerry” Lavern Albright on May 19, 1941. He died April 20, 2000. Virginia was also preceded in death by a son, Darrel Albright; a brother, Victor Hartman; and two sisters, Naomi Getscher and Loretta Dix. Survivors include three sons, Gerald “Corky” Albright (Jeri), Delia, William Albright, Topeka, and Steve Albright (Debbie), Mayetta; two daughters, Debbie Simecka (Chuck) Topeka, and Mary Jo Albright-Peterson (Mike), Ottawa; a sister, Helen Eakes, Topeka; 14 grandchildren; and 24 great-grandchildren. Mass of Christian Burial will be held at 10:30 a.m. Saturday, Dec. 12 at St. Francis Xavier Catholic Church in Mayetta. Burial will follow in Hoyt Cemetery. Virginia will lie in state after 9 a.m. Friday at the Chapel Oaks Funeral Home in Hoyt, where a Rosary will be prayed at 6:30 p.m., followed by visitation.